Ensure your food is cooked within just the right amount of time with quality kitchen timers. 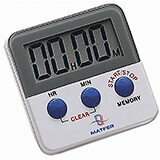 Our kitchen timers are the perfect companions to help you manage a professional kitchen effortlessly. Using them, the chefs keep a close watch on the dish so that it's always cooked to perfection. You don't want your dish to look and taste overcooked, do you? Our kitchen timers feature a sleek, small design that easily fit into your hand or they can be conveniently clipped on the pocket or apron. They come with a digital display screen that lets you keep an accurate track of your cooking cycles. 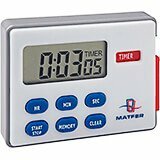 Our handy kitchen digital timers are designed with smart functions to let you continually track and master everything you do in any kitchen environment. Digital display. Magnetic back with clip. Easily fits in a pocket. Supplied in a blister pack. Measurements: 2" Diam. x 2 7/8" W.
Digital display and magnetic back with clip. 3 functions: seconds countdown timer. stopwatch. 24-hour clock. Supplied in a blister pack.